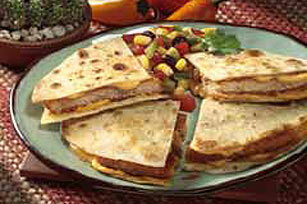 Our Quick Chik'n Quesadilla is a tasty twist on a traditional favorite, and only takes 10 minutes to prepare. Microwave patty as directed on package; cut into strips. Heat oil in nonstick skillet on medium heat. Add 1 tortilla; cover with cheese, chik'n strips and remaining tortilla. Cook 2 min. on each side or until golden brown on both sides. Serve with a fresh garden salad on the side. Cut into small wedges if serving as appetizers.